Who Wants to Travel with me to Ireland this Summer…check out the link below! Established in 1988, and settled in the heart of Long Island along Islip Ave.in the small town of Islip, Little Shop of Shamrocks prides itself on bringing the tastes and wares of Ireland to the local community. 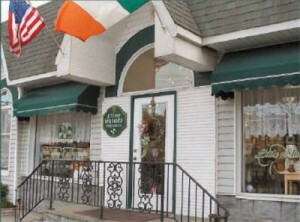 Little Shop of Shamrocks is proud of its 30 years of service to the local Irish community and invites you to experience the largest selection of Irish goods on Long Island! At this 2000 square foot Irish Import Store, you will find everything from fine giftware, jewelry, clothing, imported Irish food, special collectibles & keepsakes – which are shipped and delivered straight from Ireland throughout the year. Prepare to meet some very welcoming and gracious store personnel – and return customers who frequent the shop and who all share a love of Irish heritage and culture – you just might strike up a conversation that will make you smile. Special orders are welcome and we will accommodate your needs to the best of our ability. Contact Linda Low, proprietor, at 631-224-4311 or by email at shamshopinfo@att.net for a tailored shopping experience. Free gift wrapping is also available. So bring a little bit of Ireland to your home and stop in and visit. We look forward to meeting you!